MLP morning | Flickr - Photo Sharing! 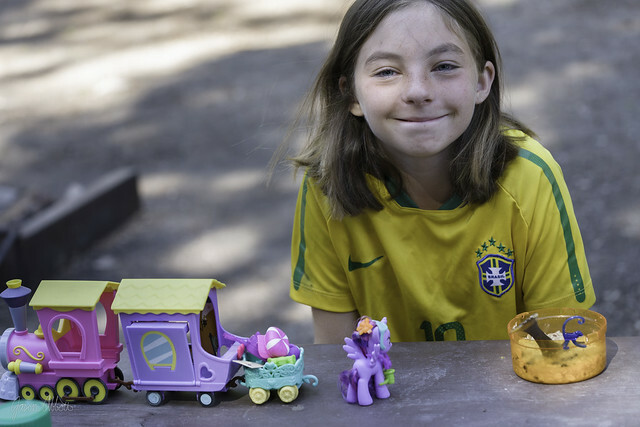 Morning finds Brenna still sleepy-eyed, driving a train of My Little Ponies across our picnic table. She got rid of her substantial MLP collection last year, presumably having outgrown them. But lately she’s plead for Fred Meyer trips to re-acquire each pony. I think it’s great to play with toys, to imagine stories, at any age. I’m always delighted to watch her build their worlds and voice their interactions. At the same time, I’m sensitive now to behaviors that might be coping mechanisms. Last week she voluntarily spent two days cleaning and arranging the house and I wondered if it was an effort to put things right, back where they belong.